radiation oncology, may be used alone or in combination with surgery or chemotherapy drugs. 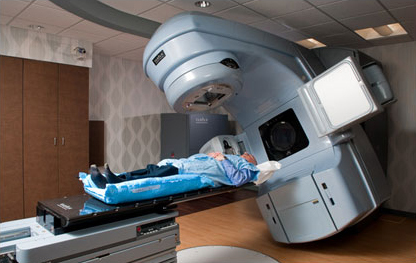 For many types of cancer, radiation therapy is the treatment of choice for cure. For other cancers, it may be used to relieve the symptoms of cancer or to control its spread. The exact course of treatment is determined according to the type of cancer and its stage at the time of diagnosis. More than half of cancer patients in America receive radiation therapy at some point during their treatment. Radiation may be delivered to the body internally, by implanting radioactive materials inside the body at a tumor site, or it may be delivered externally, by directing beams of x-rays, gamma rays or atomic particles at a cancerous tumor. The information presented in this article focuses on external beam radiation. Usually, the radiation delivered during external beam radiation is produced by a machine called a linear accelerator. This machine generates high-energy radiation by accelerating electrons to nearly the speed of light. The radiation produced by a linear accelerator contains so much energy that it is measured in millions of volts. When this powerful form of radiation strikes human tissue, it damages cell DNA, causing the cells to die as they are about to divide. Healthy cells are able to adapt and regenerate, but malignant cells are not. Thus, a carefully planned series of accurate radiation therapy treatments can gradually shrink and destroy malignant tumor cells. To minimize damage to healthy tissue that surrounds a tumor site, members of the radiation oncology team work together to ensure that the radiation dose is calculated carefully, that the radiation beam is targeted precisely, and that each radiation treatment is delivered accurately. This description was taken from the ASRT website. For the full description, click here. Get additional information from the Bureau of Labor Statistics - click here.